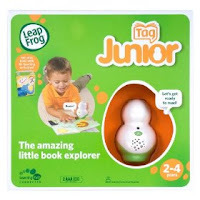 Amazon.com has a sale going on for the LeapFrog Tag Junior book pal for $14.99. This tag reader is designed to help children read books, by allowing a child to scan over a word or sentence and having it read to them. Leapfrog sells a large variety of compatible books for the reader anything from Pooh Bear books, to Curious George Books, and other popular titles. This reader usually goes for around $25-$35.